From the 1Department of Surgery; 2Departments of Radiology and Molecular Imaging, Sultan Qaboos University Hospital, Al Khoud, Muscat,Sultanate of Oman. Address correspondence and reprint request to: Dr. Khalifa Al-Wahaibi,General and Vascular Surgery, Department of Surgery, Sultan Qaboos University Hospital, Al-Khod, Sultanate of Oman. Al-Wahaibi KN, Al-Azri FH. 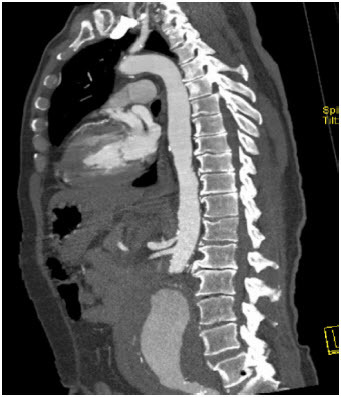 Syncopal attacks and severe abdominal pain. OMJ Oct 2010; 25(4):318-319. A 54 years old male, chronic smoker, hypertensive on beta blocker presented to the emergency room with a history of syncopal attacks from early morning followed by severe abdominal and back pain lasting for four hours. There was no history of trauma, fever or change in bowel habits. On physical examination, the patient was drowsy with a heart rate of 70 beats per minute and blood pressure of 60/30 mmHg. The abdomen was distended with mild tenderness. No pulsatile abdominal mass was felt and no audible abdominal bruit was heard. Femoral and distal pulses were palpable. Both his feet were cold to touch. 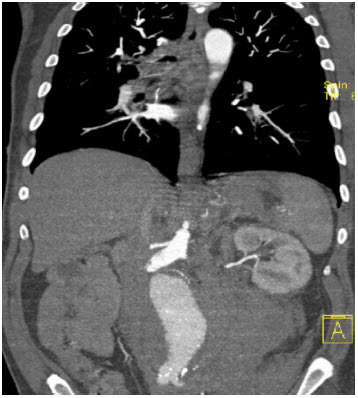 An urgent CT scan with intravenous contrast was done. 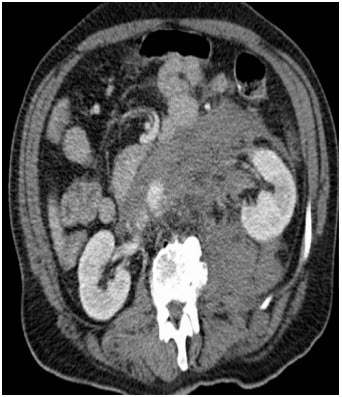 What are the CT scan findings?